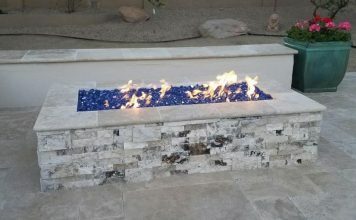 Flaming Attractions: Our custom Phoenix fire pits & Scottsdale fire pits gallery. 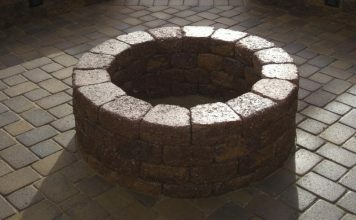 Your patio called and said you need an outdoor fire pit. How about this modern rustic design in concrete? It's a great casual look. The excitement factor on patio fire pits just went up several notches. Fire Glass fill will rival your most beautiful flowers - day or night. 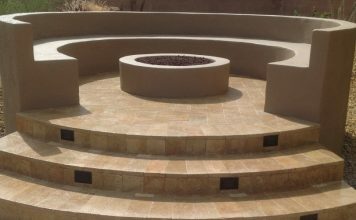 Lighted steps and a dark stone veneer on this gas fire pit in Scottsdale turns it and the flanking pillars into a stronger focal point. A gas-burning outdoor fire pit is so convenient. This one is stucco that matches the drama of the stone capping. There's a lot more going on here than this photo implies. 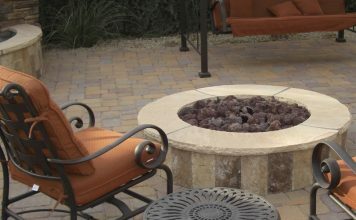 A spacious paver patio with a separate fire pit area offers several benefits. Looking for something modern and fabulous in fire pits? Phoenix clients had us do theirs in light travertine stone, resulting in great visual flow. Just two steps up to a fireside chat. 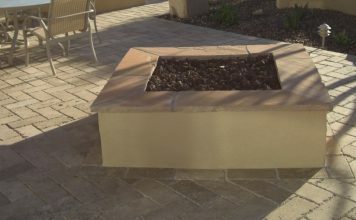 This stucco and paver fire pit blends the patio and house colors and features a built in bench. Travertine is wonderfully versatile. Here it's paired with rustic split stone for a casual, yet elegant look in Anthem. 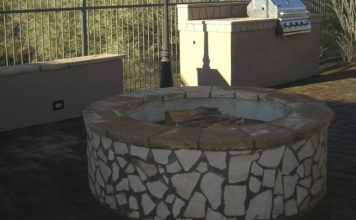 Create a separate outdoor space like this raised fire pit in Anthem. Conserves valuable patio space. 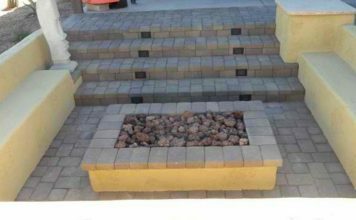 As top notch Phoenix landscapers, we take quality and creativity seriously. 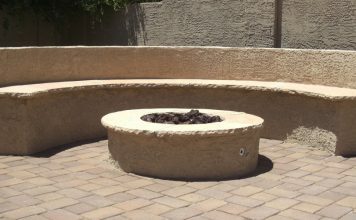 This Phoenix gas fire pit's a twist on the indoor conversation pit. 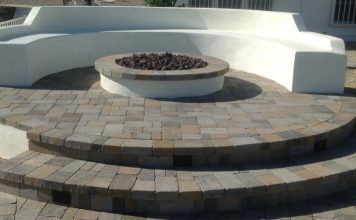 A unique outdoor fire pit's design that blends the colors and materials used around it in this Glendale landscaping patio project. 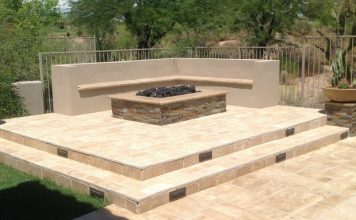 Lovely stone work and paver seating area make this Anthem fire pit's presence a great patio design feature. 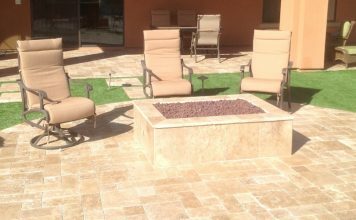 Getting more from patio designs is easy with Scottsdale fire pits. 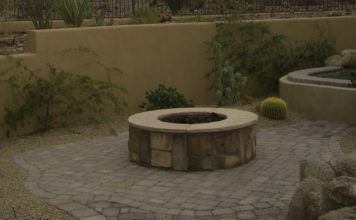 Outdoor living space features masonry fire pit and seating with paver patio. 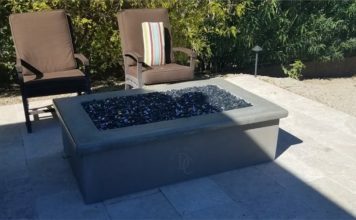 Patio designs with all the best features include custom fire pits. An unusual square design crafted from Phoenix stone and masonry. 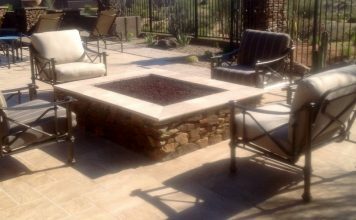 All the comforts of Arizona outdoor living patio designs. 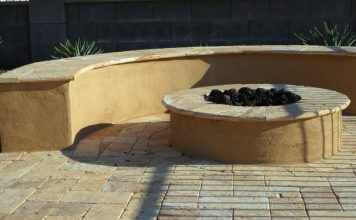 Custom water features and seating around lovely fire pits of stone or block.